Do you struggle making practice more game-like? Could your players get more competitive in practice? If so, then check out a great way to count points that will make your practice scrimmages much more competitive. You’ll win a lot of games if your players simply “do their job” and make the routine plays. Discover a competitive way to practice making those routine plays! It’s great that your shortstop can go deep in the hole and make a rocket throw to first. Or that your catcher can throw from her knees. But, it’s even greater if your infielders and outfielders can all make the “routine plays”, that your pitchers can get batters to hit into routine outs, and that your hitters can execute the situation and do their jobs! You can preach this stuff until you go nuts, and still, during games, you watch your players botch the bunt, or bobble the easy groundball…over and over again. Players love competition, so here’s a great way to make execution of the routine play – competitive! 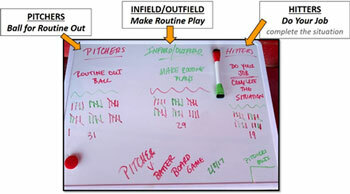 You’ll need a white board of any size, 2 different colored markers, and then set your team up in a scrimmage situation. While you can always scrimmage off of front toss, using batting T’s, or live pitching – this points system works when you scrimmage against your own pitchers. If you have a lot of time scheduled for your scrimmage then start each batter with a 0-0 count. But, if not, then start each batter with a 1-1 count. +1 for the Pitchers every time they get a batter to hit into a routine out. +1 for the IF/OF anytime they make a routine out. +1 for the Hitters every time they do their job, which includes getting the bunt down, hitting behind the running, keeping the ball on the ground when needed, hitting a deep flyball when needed, or executing any signal you give them. The team with the most points wins, and they determine the penalty for the 2 losing teams (from a list of penalty options). It’s possible for all 3 groups to get a +1 on the same play if, let’s say – the batter hits behind the runner at 2nd (+1 for Hitters), it’s a routine groundball (+1 for Pitchers), and the IF fields the ball and throws to 1st (+1 for IF/OF). Anytime you can track progress and count points the situation becomes more competitive, and making things measurable allows everyone involved to see areas that need improvement, and notice progress as well! Discover your own ways to make your players more game-ready and start seeing more success on the ballfield! ALL 68 of our eDrills! Remember – if you’re a Vault Classic member you have access to all of these 68 great drills!! If you’re not, then join now!